The French painter Claude Monet is famous for his impressionist painting of gardens. Monet loved Japanese water gardens. Although he never visited one, he read about them in books. When he purchased land in Giverny, France, he decided to add a pond with a Japanese style bridge, covered in wisteria. One of his more acclaimed paintings depicts this famous scene. For more than twenty years Monet found inspiration for his art in the seclusion of this water garden. Weeping willows and other vegetation surround the pond. Monet�s painting were noted for the reflection of the beautiful plants and bridges in the water of the pond. He loved to show the inverted world mirrored in the water. 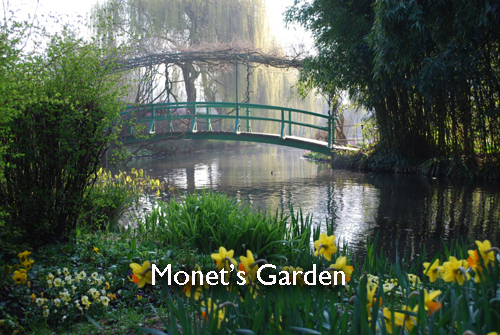 Today Monet�s garden has been restored, the graceful Japanese bridge rebuilt. Visitors can tour the gardens, walk on the bridge, and look into the pond that inspired him.